IR Universal Remote will replace your physical TV remote for good! Plus you can control other devices like Air Conditioners, Fans, Lights, and more. This application will turn phones and tablets with a built in remote IR blaster into a fully functioning universal remote. NFL Season and NCAAF College Football season are back! Make sure you don't miss a game with IR Universal Remote. Are you watching TV with an antenna? Are you watching or looking for channels like ABC, CBS, NBC, FOX, The CW and more? Then checkout out our brand new app TV Towers It's the perfect app for finding the best direction to point your DTV antenna. You can easily browse through all of the different categories and code sets to find the best remote that works for you. 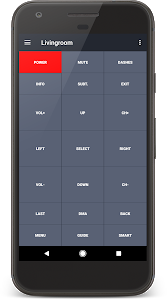 All saved remotes can be quickly and easily accessed from the sliding menu panel. IR Universal TV Remote does not require any purchases to work. The application is supported by in app advertising. Ads allow users to use any remote in the app for free. You can remove ads for a small one time only fee inside the app if you would like. 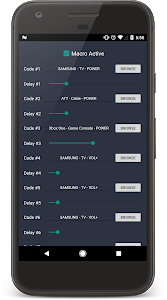 Create completely custom remotes. You can edit almost every aspect of your remote. Change the toolbar color. Edit the background color or upload a background image. 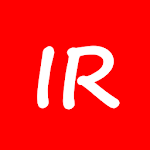 Edit button IR codes, colors, positions, roundness, transparency, and texts. 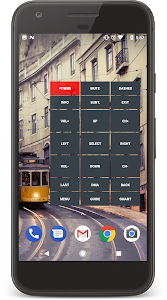 Use the two widgets to quickly and easily control devices from your home screen. 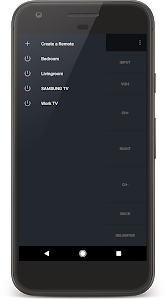 Use the notification remote to control devices while using other apps. Control multiple devices from 1 remote. Setup macros to send multiple commands to multiple devices with a single button click. 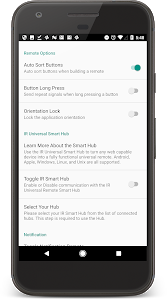 If you have the IR Universal Smart Hub then you can connect to multiple hubs at once for controlling devices in different rooms. 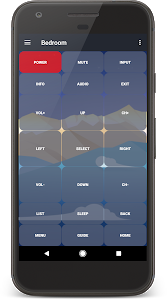 You can also read infrared codes directly from other remotes into the Smart Hub and the App. Photos and Media (Optional): This allows you to add your own custom images and graphics into the app. 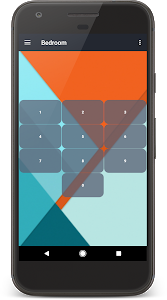 You can add images from your image folders to the remote background. Network Access: For internet access. The IRUDB™ database is accessed via internet. Similar to "IR Universal TV Remote"